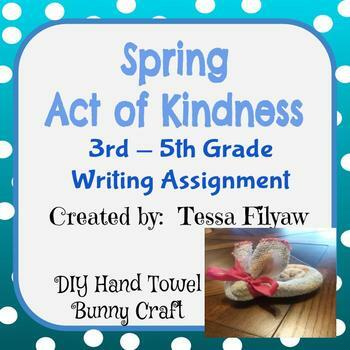 This is a wonderful spring activity to help promote kindness within the school. Students follow 4 easy steps throughout this activity. 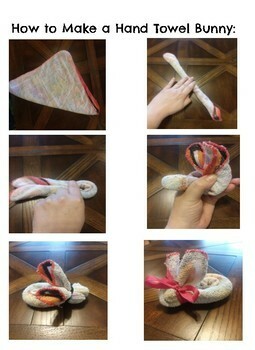 First, they follow directions to make an adorable hand towel bunny. They select someone to give their bunny to as an act of kindness. Then they write about their act of kindness. This is an excellent end of the year project and writing assignment. Learning Target: I can write routinely over shorter time frames for a range of discipline-specific tasks, purposes, and audiences. 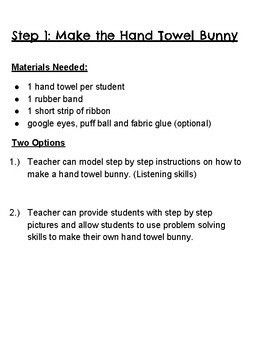 Suggestions: The teacher may buy each student a hand towel or ask the students to bring a clean hand towel to school. Some parents may volunteer to buy the class a set of new hand towels. 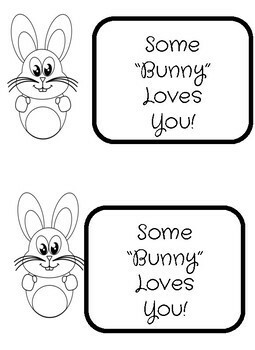 My students plan to give their bunnies to the students in our autism unit. Please rate this product and visit my TPT store for more products.